In The Bookcase: Join me >> 2018 LOUISA MAY ALCOTT Reading Challenge + GIVEAWAY!! Join me >> 2018 LOUISA MAY ALCOTT Reading Challenge + GIVEAWAY!! "I like good strong words that mean something…"
Welcome to the 2018 edition of the Louisa May Alcott reading challenge! Hosted by the blog In the Bookcase, yours truly. Have you ever sampled a good story from the charming Miss Alcott? Is it time for you to finally read (or re-read) Little Women & the sequels? Would you like to enjoy Miss Alcott's writings with me this June? 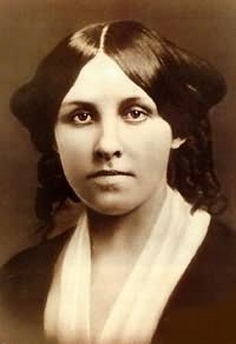 Louisa May Alcott (1832–1888) is an American authoress who inspires me. During her lifetime in the 19th century, she penned pages upon pages, delighting young girls and womenfolk, both then and now. Aside from being a writer, she briefly spent time nursing on the battlefield, and otherwise throughout her life supporting reform movements such as women's education, women's suffrage, abolitionism, and temperance. 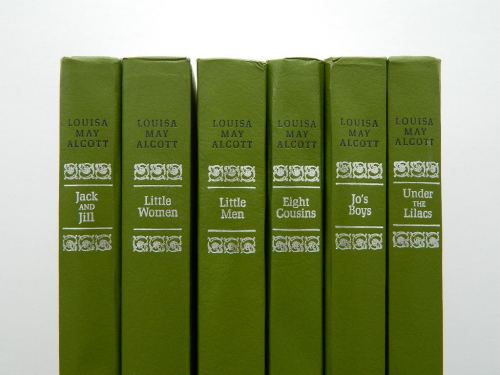 Alcott wrote over a dozen novels, alongisde many short-story collections. Little Women is arguably the title of her most famous work, the story of 4 charming girls --- Meg, Jo, Beth, and Amy March --- growing up during hardships of the Civil War. Most readers can relate a close kinship to at least one of these blossoming characters --- through their pleasures, adventures, suitors, and life in general. I cherish Miss Alcott's writings --- and although I've enjoyed a few books of hers throughout the last few years (of hosting this challenge!)... I still have much to discover about this hardy woman, her life, and her family. So I'm endeavoring this June to pick out a couple of good books written by or about this favorite lady-author of mine, and glean from the shining pages. The challenge is now open and lasts through the whole month. You might like to take a moment to peruse (my bloggy friend, now turned author) Susan Bailey's articles at Louisa May Alcott Is My Passion, where I have discovered many recommendations on suitable book titles. Also visit another blogger/author Trix Wilkins and her amazing articles about Miss Alcott's best-loved novel at Much Ado About Little Women. Won't you join me in a good book? Compile your list of Louisa May Alcott books that you would like to read, finish reading, or maybe re-read during June. Even books about L.M.A. (and the Alcott family) are welcome---biographies, fictionalized accounts of her life, etc. Your goal could be 1 book, 5 books, or short stories. To supply more options, you may decide to download audio book or e-books. Write a blog post, or social media post explaining all about the books you want to read for this challenge. Goodreads, Twitter, Pinterest, and Instagram, (etc.) posts are welcome, if that's you're preferred method. Grab the challenge button and include it in your post if possible, so that others can find the challenge too. * For those without blogs/social media: Tell us what you're reading in the COMMENTS SECTION below! This challenge is open to EVERYONE, and I hope any Alcott fans out there will find a way to participate. Link up below! Every time you share an update or, say, a book review, add it to our ongoing linky. I'll be stopping by to see your progress! The linky is the main headquarters of this reading challenge, so that the other participants can follow everyone's progress just by taking a look at the list of all the posts. Browse through the other participants' blog posts, to see what everyone else is reading, and be sure to leave comments when you can. The only thing better than enjoying a good book, is enjoying it with like-minded friends! Enter the giveaway! See below. 3 people will WIN!!! Tell us about what you accomplished over the course of the challenge. Include any closing thoughts, or what you think of Louisa May Alcott now that you've read more of her works, etc. I'll be very pleased to hear about what you think at the end of this challenge! Not sure what to read for the challenge? Check out my [List of published titles by Louisa May Alcott] for some literary inspiration this June. June 1st ::: Start date. Get to reading! June 2nd ::: My book list for the challenge. Is your list ready? June 30th ::: End date. Final overview and link-up! Winners list announced. Submit your Louisa May Alcott blog or social media posts on the linky below. ANY and ALL of your posts about Miss Alcott are welcome. If you decide to share a favorite quote, a book review, or any other thoughts... link up and take a look at some of the other participants' posts. In honor of the esteemed author we're celebrating this June, I'm offering 3 winners (yes, yes, & yes!) a lovely art print featuring either wise words from Miss Alcott herself, etc. Wouldn't you like this artwork hanging on your wall? Choose 1 of the 5 offered designs! *Plus! Each winner can choose whether they prefer the white or chalkboard version of the quote artwork. To each her/his own. Please note the frame or other props are not included with art print prize. The giveaway is open to EVERYONE, whether you're participating in the reading challenge or not. (You can get 5 extra entries in the giveaway if you are taking part in the Alcott challenge!) Invite your literary-minded friends! Want to make a purchase from Pixel Berry Pie Designs sometime this month? I have a coupon code just for YOU!! I'm simply delighted to be spending my summer sifting through the writings of Louisa May Alcott. And I can't wait to see which books you're going to read for the challenge as well! Get your sign-up posts online NOW and link-up. Looking forward to this! Just started reading :) Thanks for hosting and those giveaways look amazing! Count me in! I had mentioned it on the end of my Nightstand post, but I'll make a separate post tomorrow. Thanks for the invite. I am excited to join this challenge. I went to my library's e-book site to pick up the audio book of "Little Women" and guess what -- there is a waiting list on all four copies! Great to see that so many are "reading" this classic. Can't wait to start. I hope you'll be able to join us soon with your pick! Did you know there are several Little Women audio books available to download via YouTube? Aidyl, whatever fits your reading schedule is great. Have fun with your summer reading! Both Eight Cousins and Rose in Bloom are LOVELY stories! I just know you'll enjoy them. Whatever reading you get done, I hope you'll share your thoughts with us. This will be fun. I am rereading Little Women. Okay, that sounds great! Little Women always makes for a fabulous re-read. So glad to have you join the reading challenge this year. I was literally thinking Monday that I wanted to reread Rose In Bloom. My favorite of her works is An Old Fashioned Girl, so I might need to add that to the stack. Also I love how the banner has Jo's scribbling suit! It will be wonderful to join the challenge, although it is rather late!